In 2002 Darren Clarke made the final rounds of the Murphy's Irish Open thanks to advice of his stand-in caddie for the day - after his regular caddie Billy Foster had flown back home to Manchester after the birth of his second daughter. Following a call to his friend Paul McGinley, the Dubliner's caddie JP Fitzgerald was the late replacement and his presence proved pivotal at the 18th - according to Clarke. Speaking at the time Clarke said: "At the last JP said, 'If you lay up and miss the cut by one you'll be as sick as a dog'. At the start of the following year Clarke embarked on a series of drastic changes with his golf in order to challenge for the Majors again and switched back to Butch Harmon as his coach, parted company with Foster, after six years together, and signed a deal to play with TaylorMade clubs. The complete overhaul came after a Christmas letter from sports psychologist Bob Rotella and as part of his new look team he added J P. Fitzgerald. Despite much promise the partnership did not last and they subsequently split with Clarke accepting that he is one of the more demanding players on tour to work for, and both parted company following the 2004 Masters - despite winning the 2003 WGC-NEC Invitational at Firestone. "I know I've been very hard on JP. My demands were too great, I expected him to pick the right club every time, and while I wasn't jumping down his throat non-stop, I was complaining," said Clarke at the time. Originally from Castleknock, Fitzgerald represented Baltray as an amateur and actually beat Clarke in the semi-final of the Irish Close Championships in 1987. After attending East Tennessee University on scholarship, Fitzgerald was recruited by his close friend Paul McGinley, helping with that infamous putt in the 2002 Ryder Cup at The Belfry. “Ernie and Ricci are such close friends that the caddying part of it was putting a strain on their relationship. Roberts started back with Els in May of 2001 - after a split in the latter part of 1998 – with two U.S. Open victories in 1994 and 1996 to their credit. In the period of Roberts absence there were only a couple of PGA wins for the South African and it fell well short of what was achieved on Ricci’s return when Ernie won The Doral, The 2002 Open Championship, and The Sun City post season event. In that time, the pair also added the World Match Play Championship at Wentworth. Ironically, Ricci Roberts joined Darren Clarke in April 2011 playing their first event at the Trophee Hassan II in Morocco with Clarke’s manager Chandler no doubt playing a role in the decision. 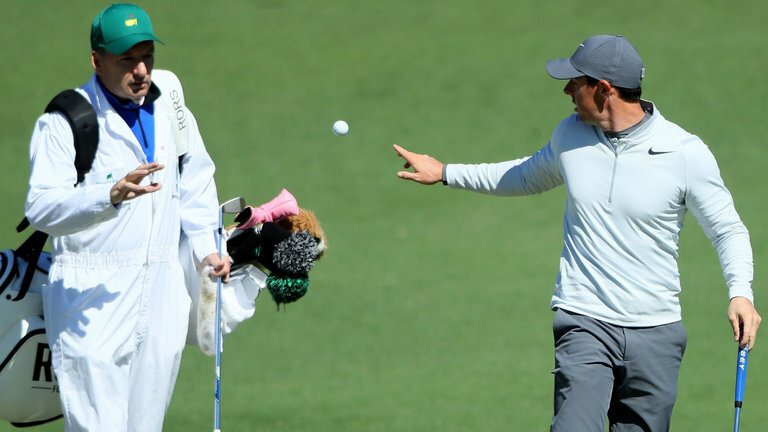 In the same week, almost much ink and paper met on the why’s and wherefores of what went wrong with Rory McIlroy at the tenth tee box on the Sunday of The Masters at Augusta National. The last moment the young McIlroy was to lead the 2011 tournament. After which much of the focus started to move in the Fitzgerald direction. Makes one recall some of those memorable Masters stories. For McIlroy, it was a touch of the same when Schwartzel chipped in at the first and then eagled a blind shot so dramatically at the 3rd. It was clear from those early moments that destiny was marking the South African's card and in all the post analysis the role of fortune and luck got no mention. The reality is no major has been won without it. Nor any other sporting event for that matter. At Sandwich for the 2011 Open it was the turn of John Mulrooney to be in the right place at the right time and Clarke was generous in the praise of his caddie when collecting the Claret Jug on the eighteenth green. One hoped that it was the start of a longer terms thing. But it was not to be that enduring. One of more enduring partnerships is Phil Mickelson and Jim “Bones” McKay. Which undoubtedly has been tested to its limit with all challenges in Phil's private life, given his wife, Amy’s, battle with cancer. Compounded by a similar fate befalling his Mother, along with Phil’s own health worries of sporadic arthritis. Those events notwithstanding Mickelson won his third green jacket in 2010 with a tournament winning shot on the 15th which commentators suggested his caddie should have advised him against. These days it makes for uplifting footage that confirms that destiny was with Lefty that day and the gap between those pine trees was never an issue. In the most high-profile team of Tiger Woods and Steve Williams the toughest of personal challenges beset the player. With indiscreet remarks by the New Zealander also problematic at times for his employer. Although others were fired for less Williams offered some key components on the course to the former world number 1 and was richly rewarded for his efforts. So much so the Kiwi commuted almost weekly across the Pacific Ocean as he tried to maintain his own personal life intact as well as caddying. Having been fired by Norman in 1989 Williams admitted he had got too close personally to Norman, although both remain good friends to this day. To the point that Norman later admitted he had made a mistake during the Kiwi and tried to rehire him. The fall out last year between the Woods and Williams team showed that nothing lasts forever. On the other hand, the stories of swift caddie changes that have led to dramatic results also abound. The addition of Phil “Wobbly” Morbey to the side of Ross Fisher shortly before the 2011 3 Irish Open as a replacement for Andrew Morrow proved immediately successful. Fisher won the €500,000 cheque in Killarney with the caddied that had done the same with Ian Woosnam and Thomas Bjorn previously. “I think Wobbly has given me that extra bit of added confidence, some self-belief, and like I say, he's great on the bag. He tells me exact little how it is. Doesn't beat about the bush. Tells me exactly where I need to go, what club it is and it's just real positive. So far, the relationship is good and fingers crossed, we can go a very long way,” explained Fisher in July 2010. JP Fitzgerald has been part of the more enduring partnerships in golf history. Becoming one of the most successful with four major titles to his name.